Does your garden suffer from the blahs? You know, that late season feeling when everything looks past its best before date and a walk around the garden drags you down? That’s how my garden has been looking recently, and that’s how I’ve been feeling. But I may have found a remedy. To prepare for a short talk I gave last week, I flipped through my photographs of gardens in Scotland and the north of England. Some photos I passed by quickly, others made me stop for a second look. Why? Sometimes because a photo was really good. But more often because it reminded me of why I’d taken it in the first place. Those photos showed Wow! moments. You know what I mean — those times when you see something that stops you in your tracks and takes your breath away. I went back and looked at each image more carefully. What made those particular moments different? What caused the excitement? 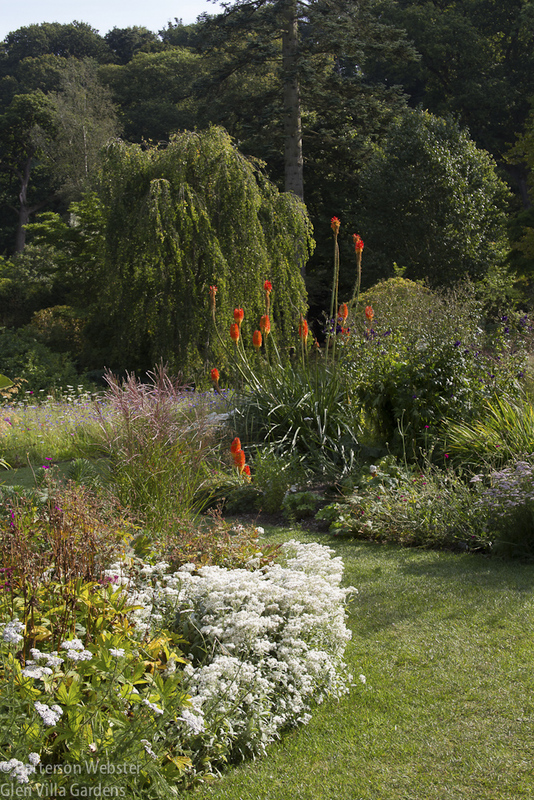 At Gresgarth Hall, the personal garden of the internationally renowned garden designer Arabella Lennox-Boyd, it was an unexpected colour. The colour and shape of the red hot poker smacked me in the face, but in a delightful way. A tall outburst of colour, so different from the colours seen in other parts of the garden, created a real Wow! moment. Literally, my eyes widened with surprise. 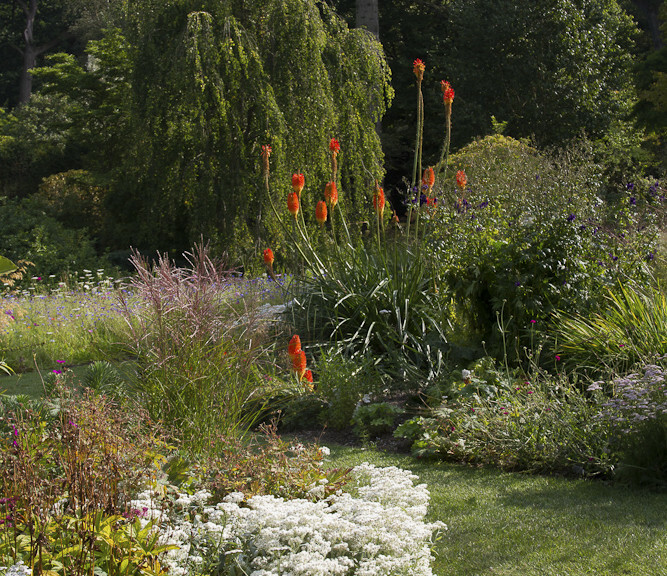 The red hot pokers were visible from other parts of the garden, too, always drawing the eye and acting as a focal point. They were a Wow! from every direction. 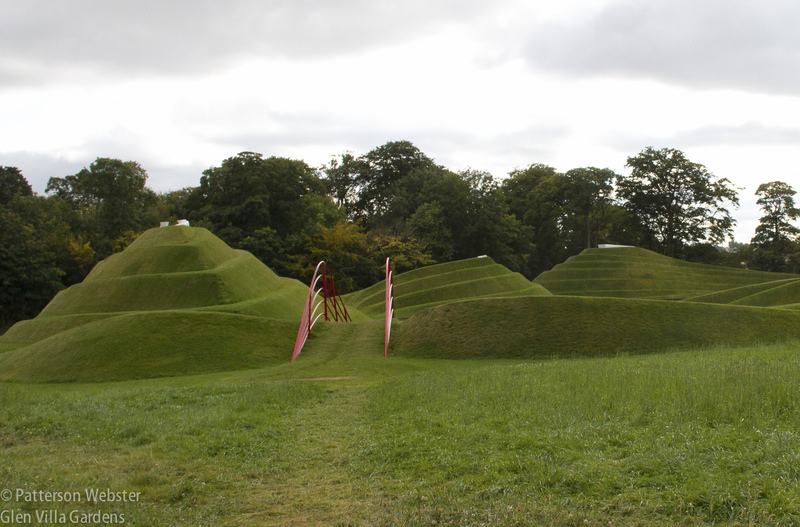 At Charles Jencks’ Garden of Cosmic Speculation, two red bridges stood out from the verdant surroundings. While the shape and colour of both were striking, they weren’t really unexpected or unpredictable. Red is often used for bridges in Chinese gardens or in gardens inspired by traditional Chinese garden design. Since the spiral mounds which are the centrepiece of The Garden of Cosmic Speculation rise out of that tradition, painting them red was not a surprise. The lines of the bridge mimic the spiral paths on the three mounds visible here. 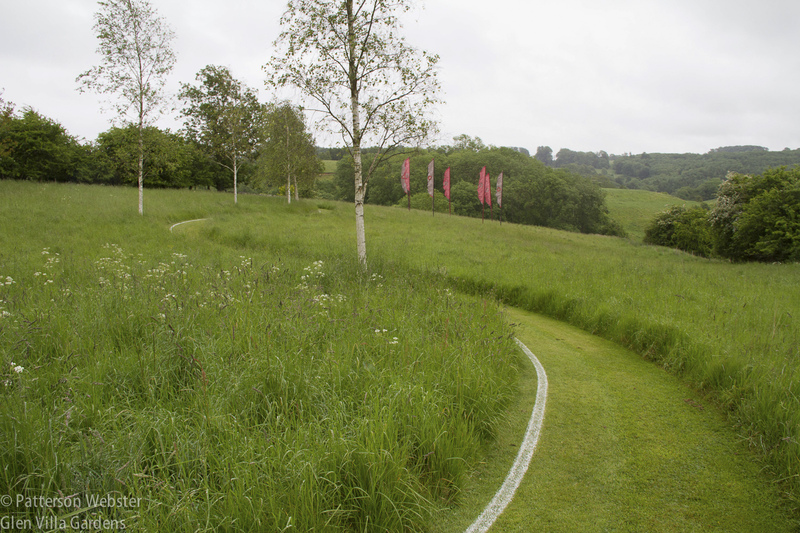 The path through the grass, worn by visitors and passers-by, could do with some improvement. Still, this difference pointed out something important. To be unexpected the surprise element — whether it is a colour, a shape or an object — needs to differ in some significant way from the rest of the garden. It has to vary markedly from the garden’s norm, whatever that norm may be. In a formal garden a curving path can be unexpected. In a garden with Arts and Crafts elements, it can be a white line drawn on the grass. 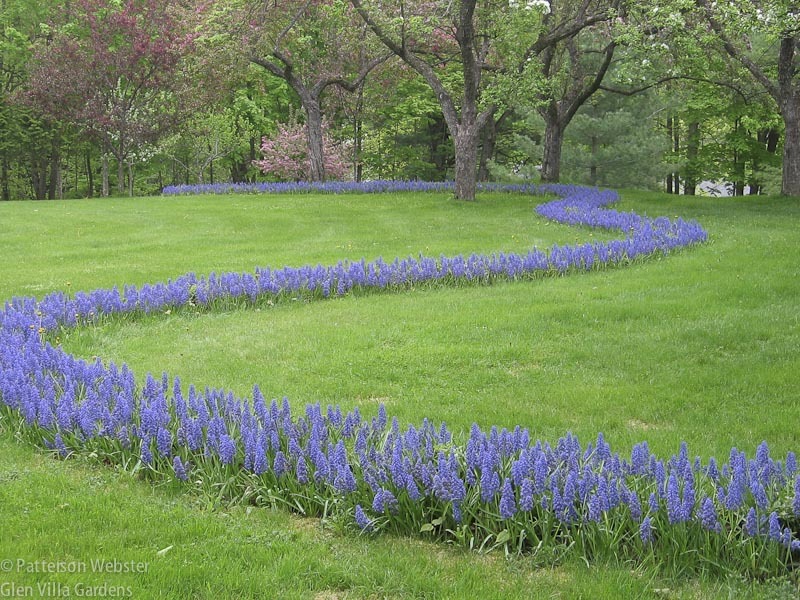 Unusual flowers or flowers arranged in an unusual way, like the muscari path at Glen Villa, can be a surprise. This photo is from 2007, the spring after we planted the muscari bulbs for the second time. 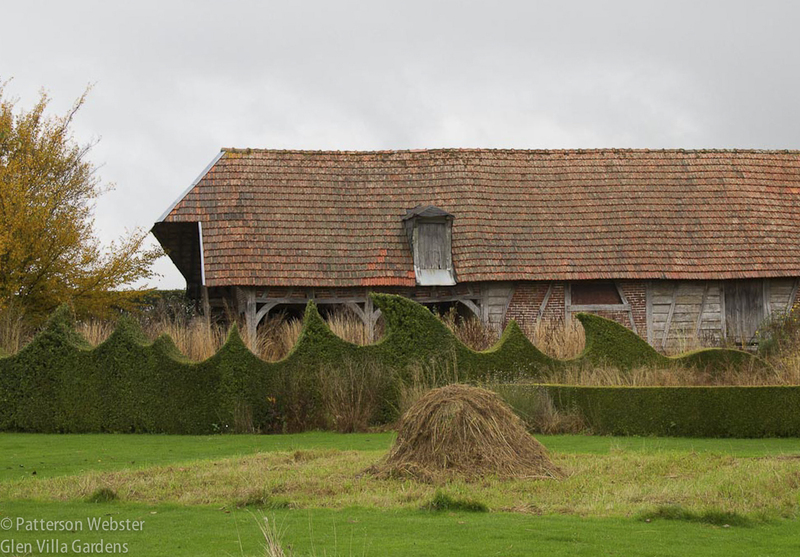 So can hedges trimmed in an unpredictable way, like these at Le Jardin Plume in Normandy. Hedges cut in unusual ways are a feature of le Jardin Plume. On my recent UK tour I saw equally inventive hedges at The Garden of Cosmic Speculation, Scampston Hall’s Walled Garden and Shepherd House, a small personal garden near Edinburgh. And without doubt, objects that you wouldn’t expect to find in a garden any where can surprise the stuffing out of you. A fire hydrant could be useful in a garden, I suppose, but only if it is connected to the mains. This one was not. Without dispute, however, it acted as an unexpected focal point, drawing your eye irresistibly. 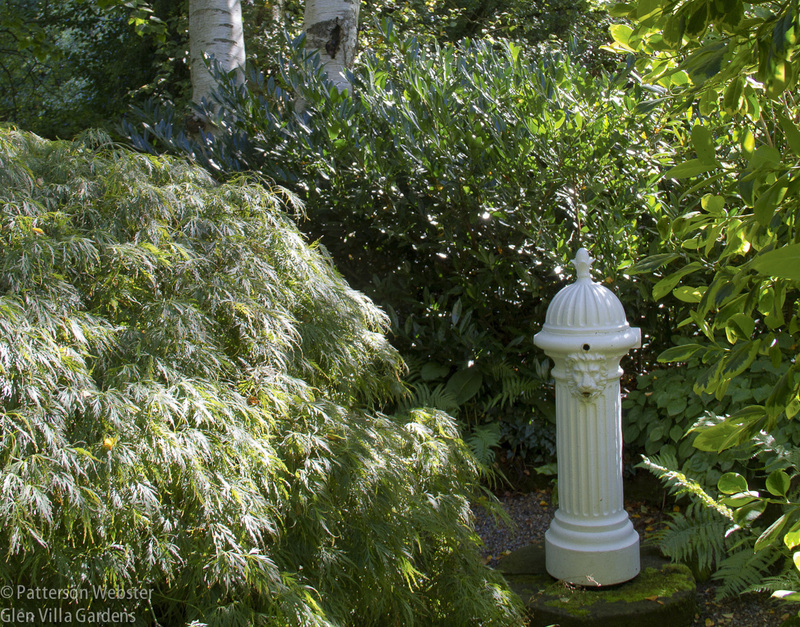 At York Gate, a garden near Leeds, I turned a corner and came unexpectedly across a stark white fire hydrant. To say I was taken aback is an understatement. I actually blinked to make sure that I was seeing what I thought I was. I admired the way the white hydrant was positioned, beside a variegated shrub and in front of white birch trees, reinforcing the tonalities of both. But a fire hydrant? Possibly there was some personal or historic reason that accounted for it, some reason I still don’t understand. But for me the fire hydrant came dangerously close to kitsch. I’m not a fan of kitsch, in gardens or anywhere else. Bicycles hanging from trees are unexpected, and can occasionally make me smile, but that doesn’t mean I like them. 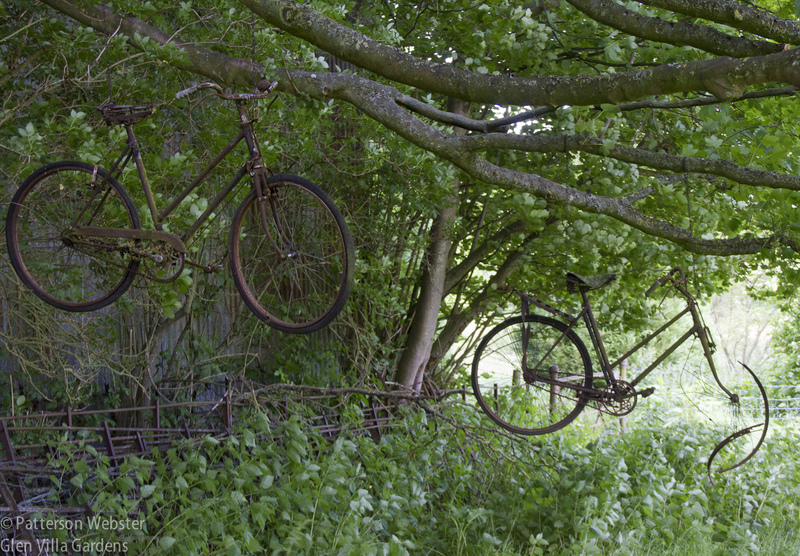 These bicycles at Bryan’s Ground near Presteigne, Herefordshire are definitely unexpected. You may find these amusing, I don’t. But then humour is a very personal thing. The same goes for garden utensils that look like pink flamingoes. I get the joke. It just doesn’t amuse me. 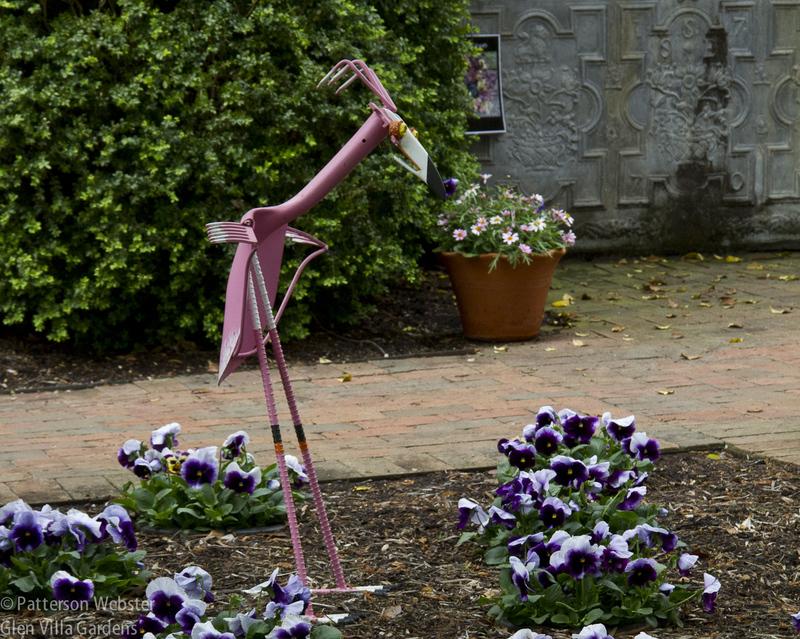 At Mt Cuba, an American garden that specializes in plants of the mid-Atlantic states, a pink flamingo made of spades and trowels seems decidedly out of place. Doing the unexpected can be risky. It takes courage to go beyond the usual, and going there doesn’t always succeed. But when it does, it lifts a garden out of the ordinary. At Broadwoodside, a garden near Edinburgh, maple tree are arranged in a grid in a courtyard. Each tree bears a label, hung like a sign on a decanter of Scotch. 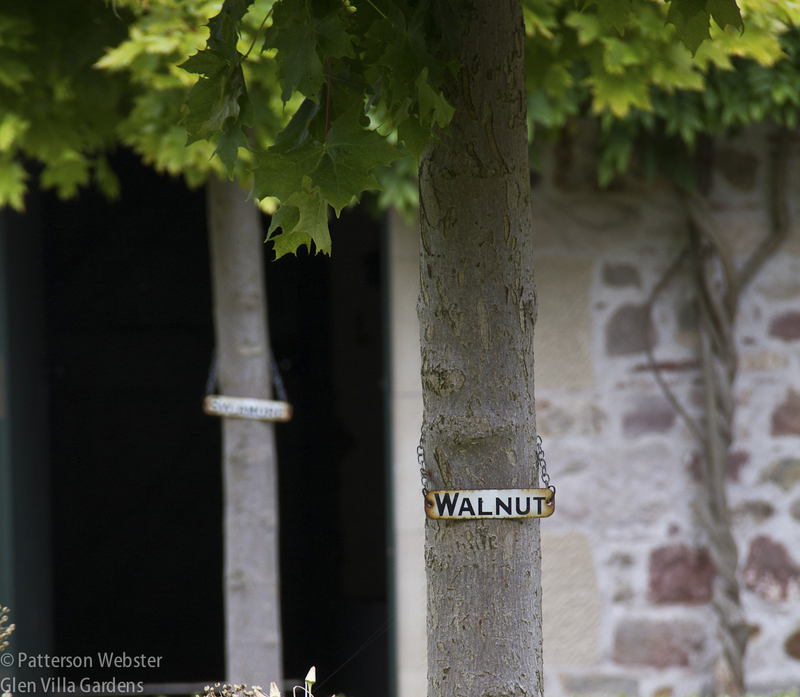 Each label identifies the tree — and every identification is wrong. Seeing these deliberately mis-identified maple trees made me think of gardens I’ve visited where labels have irritated me — to an unreasonable extent, some would say. On occasion my irritation is caused by a label misplaced, perhaps by accident. Sometimes a label identifies a bit of bare ground, leading me to think I’ve come at the wrong season. Sometimes, most irritatingly, the labels are just plain wrong. Also at Broadwoodside I saw a rather common garden ornament, a wire basket full of stones carved like fruit, sitting atop a garden wall. This typically Italianate ornament was not surprising in a garden with Italianate features. But when I looked more closely I saw that the stones weren’t carved fruit, they were simply stones. This bit of cleverness made me chuckle out loud. 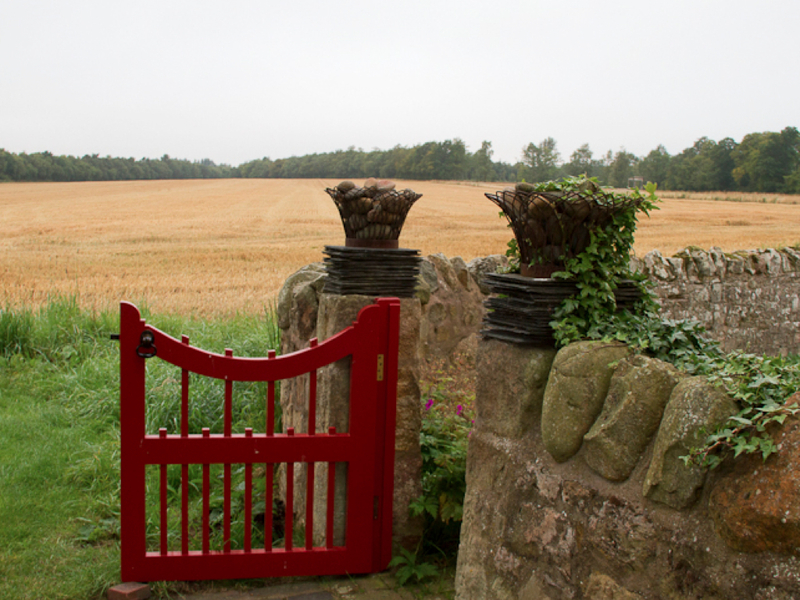 The colour of the gate is another nice touch, one of many at Broadwoodside. I plan to review the garden as a whole in next week’s post. Clearly the element of surprise is a key factor in creating unexpected Wow! moments. It’s important to remember, though, that the unexpected can’t be announced. An arrow pointing to a ‘surprise view’ as I encountered at one garden I visited on this tour negates the very possibility. No surprise is possible after a give-away like that. Even if doing the unexpected is risky, I think it is worth a try. Too often we move through gardens seeing only what we are accustomed to seeing. Coming across something that is truly unexpected can wake us up. Even more, it can wake up the garden, shake it out of the doldrums, lift it out of the ordinary into something closer to Wow. So I plan to look at my garden with these ideas in mind, to see if I can create Wow! moments by adding more unexpected touches. The additions could be unusual plants or unusual colours; they could be ordinary plants or objects used in unusual ways; they could be odd juxtapositions or unusual objects. Whatever I add, I hope that doing the unexpected will lift my garden out of the blahs, and lift my spirits as well. What about you? If your garden is suffering from the blahs, will you consider adding something to shake it up? Are you willing to take the risk? Have you already? Is it kitsch or sentimental art? I like the surprise and if it works for me hooray! Bicycles would work well at the town dump but them again that is these particular bicycles, some guys with a torch can do wonders! Ok, perhaps someone is or was sentimental about these bikes… I think the dump is a great place for them. Or maybe the bicycle repair shop. I don’t have many “things” (art if you like it; junk if you don’t) in my garden, and mostly because I am not much of a risk taker. But also because whatever I put in the garden must resonate with me–spark joy, if you will–and I don’t come across much that does. I am making an effort to include “shopping” in my occasional travels, because I’ve realized you won’t find much if you don’t go looking. And I’m trying to be braver. But I also think that if you cram too many surprises into one’s garden, the visitor gets emotionally worn out and rather inured to them. So one must find a balance. Too many surprises just become noise and confusion. I agree that if you cram too many surprises into the garden, emotional overload is the result. Finding the surprises that spark joy and strike the right balance — that’s the tricky part. I think two plants provide the most unexpected elements in our garden: Mexican Sunflower and Cup Plant. Both are so much bigger than standard suburban garden plants (especially the 10′ Cup Plants) and have such a striking color (especially the Tithonia). Of all the elements you show here, the ones I like best are the Muscari and the hedges at the garden in Normandy. Ten foot tall plants would create Wow! for me, for sure. I’m glad you like the muscari. In August, the colour changes to bright pink, when Astilbe ‘Veronica Klose’ comes into bloom. I also love the hedges at le Jardin Plume. I plan to revisit it on a garden tour I’m planning for Sept 2017. I’d love to have you and Judy join the small group. Your willow structures are wonderful focal points, Don, delightfully unexpected. The dairy farm history opens lots of possibilities for sculptures that go beyond the obvious… I’m working on a new project for a site where maple syrup was once produced. Investigating the process more deeply than I have in the past and looking into the structure of maple trees and their production of sap is taking me in some unusual directions. I love the site of maple syrup cans ( the old fashion ones) hanging from all the maple trees in the spring! Interesting project. The new method with plastic tubing weaving through the woods into large vats is kind of beautiful too. For me, the trick would be to get the element of surprise without it being jarring. I want my garden to create feelings of tranquility and joy. It’s important to me that my garden look natural, so the composition has to be made up of plants that look like plants or objects that are not discordant with the plants. This means that garden kitsch and hedges trimmed into strange shapes don’t work for me. Striking focal-point plants, the brightly colored gate and your, Muscari dragon’s tail do. I agree, Jean. What we do in our gardens comes from our goals. York Gate (the garden with the fire hydrant) was a horticultural mishmash, combining so many elements in such a small space that it should have been jarring. But it wasn’t. The divisions between spaces left room for tranquillity. At Glen Villa I’m always walking a fine line between too much and not enough — that due to the large space I work in. With a smaller area, I’d need to be more discriminating. I agree, Jean. What we do in our gardens comes from our goals for them. York Gate (the garden with the fire hydrant) was a horticultural mishmash, combining so many elements in such a small space that it should have been jarring. But it wasn’t. The divisions between spaces left room for tranquillity. At Glen Villa I’m always walking a fine line between too much and not enough — that’s due to the large space I work in. With a smaller area, I’d need to be more discriminating.